Building on the company’s legacy and expertise in the African American ethnic hair market, JPC is continuing to reinvent itself and introduce new brands with innovative formulas and products that meet the needs of today’s multicultural consumer. The Ultra Sheen® Men™ grooming collection is targeted to the trendsetting man who has style and swagger. 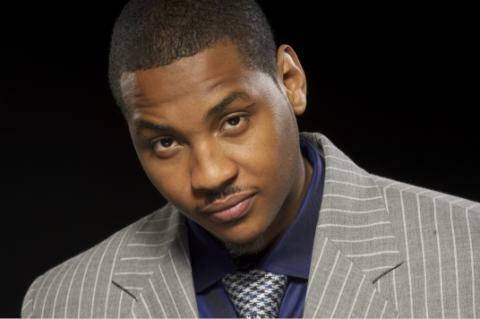 Today, no one better exudes the “trendsetting man” than NBA All-Star, Carmelo Anthony, who has signed on to lend his voice and celebrity to the Ultra Sheen® Men™ line. The Ultra Sheen® Men™ brand promotes to fashion focused men that they should always “Step Up Their Game.” In doing so, a man can “get noticed” for his high standard of style and fashion. The Ultra Sheen® Men™ grooming collection includes Ultra Sheen® Men™ Super Hold Hair Dress, Ultra Sheen® Men™ Wave Conditioning Pomade, Ultra Sheen® Men™ Lite Crème Moisturizer with Shea Butter, and the Ultra Sheen® Men™ Grooming Gel. Bringing excitement and innovating the ethnic hair care industry is not new to JPC. In fact, JPC has been a part of the fabric of the African American community for more than five decades. With a vision and a borrowed $500, George Ellis Johnson, a former shoeshine boy, created Johnson Products Company and turned it into a multimillion-dollar business. Founded in Chicago, Illinois in 1954, Johnson Products Company remains an iconic brand in the African American community. By 1960, the Ultra Sheen® product line was introduced into the wider retail market. In 1971, the company became the first African American firm to be listed on the New York Stock Exchange. At the same time, Johnson Products Company became the first sponsors of “Soul Train,” the first nationally syndicated television program for African Americans. Over their 55-year history, Johnson Products Company created 53 hair care products under the Ultra Sheen® and Gentle Treatment® brands. JPC’s partnership with Carmelo Anthony is the first of its kind for the new management team at JPC. On March 31, 2009, JPC was successfully acquired from Procter & Gamble with the combined investments of RC Fontis, St. Cloud Capital and Plus Factor, LLC, an African American management team. In two years, the new team at JPC has successfully reorganized the company and its worldwide distribution. This deal with Carmelo Anthony is a part of the company’s strategic plan to regain its prominent global market share. The deal will feature Mr. Anthony in advertising and promotional campaigns, cause-marketing and community outreach programs as well as in personal appearances for JPC and Ultra Sheen® Men™. Mr. Anthony will also be involved in the development of innovative new grooming products for JPC. For more information on Ultra Sheen® Men™ and Johnson Products Company, visit www.JohnsonProducts.com. Originally founded in 1954 and newly established as an independent company in 2009, Johnson Products focuses on strategic brand and business development in the ethnic hair care market. The company has been a leading brand in the African American community for more than a half-century and currently offers more than 60 hair care products under the Gentle Treatment® and Ultra Sheen® brands. For more information on the newly acquired Johnson Products Company, its family of brands and to download photographs of the new management team, visit the company’s Website at www.johnsonproducts.com.